Hello ... Hello ... my old friends ... It's great to see you once again! 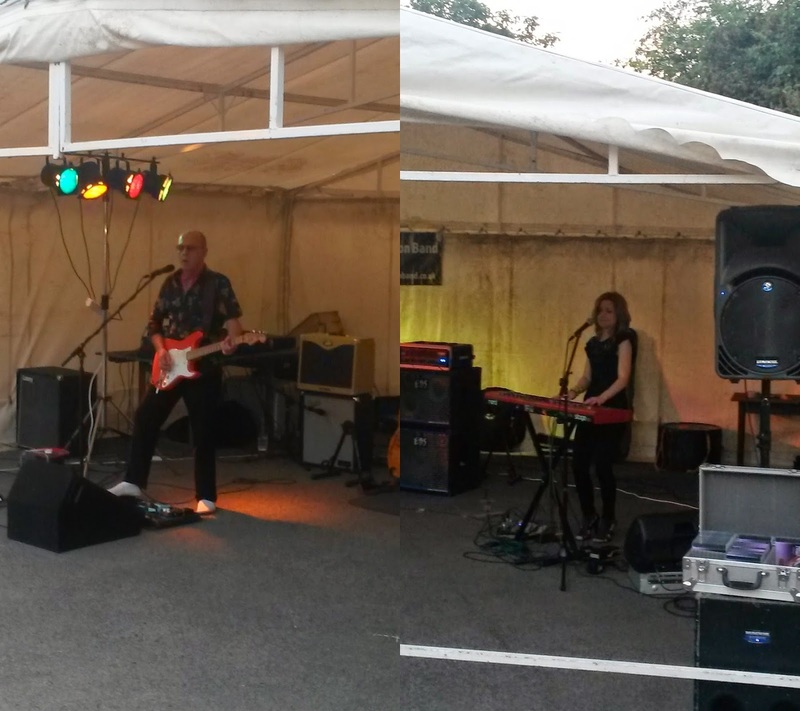 Who would have guessed that a pub car park in leafy South Staffordshire on a balmy Summer evening would be the host of such a truly epic performance of Rhythm and Blues by one of the most unsung of homegrown musical talents? 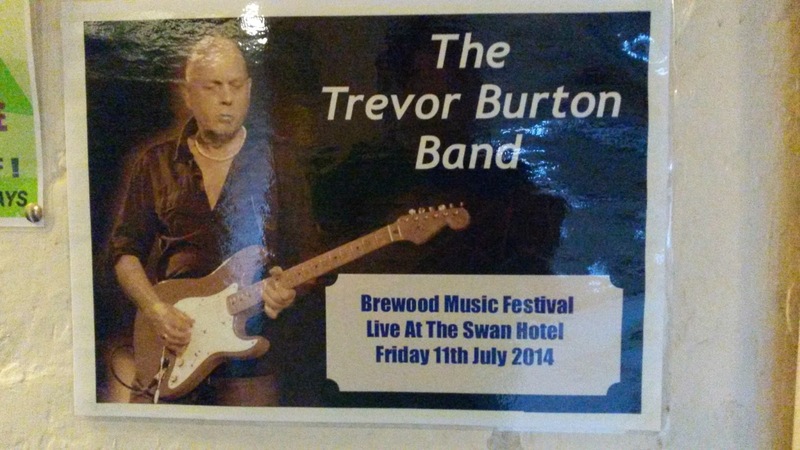 This time around, my visit to the Brewood Music Festival in 2014 was not for the main Saturday event, it was for the impressive roster of events organised for the evening of Friday 11th July that featured four slightly chronologically staggered, attractive gigs headlined by, of course, The Trevor Burton Band. But before that, an early evening arrival meant a chance to see some of the acts on show including a very accomplished set by acoustic duo Redkix [who are Emma Jay and Tony Williams-Ruth] including outstanding versions of "Lovely Day" and "Rolling In The Deep" in support of the highly rated Rebecca Downes Band. 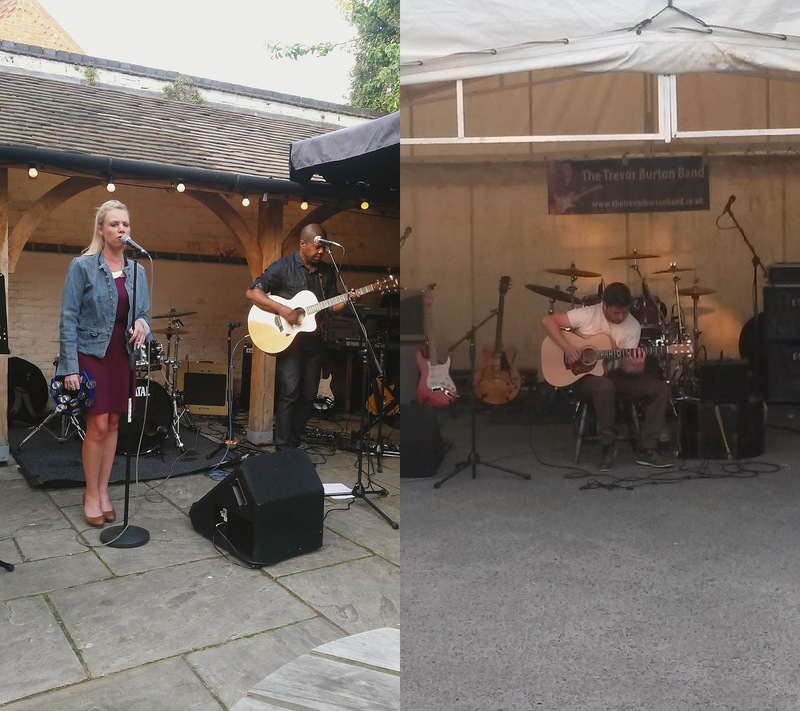 Also on show was Wolverhampton's very own acclaimed fingerstyle guitarist Pete Kent, who delivered an amazing demonstration of his talent in support of The Trevor Burton Band including an astonishing interpretation of Level 42's "Something About You". 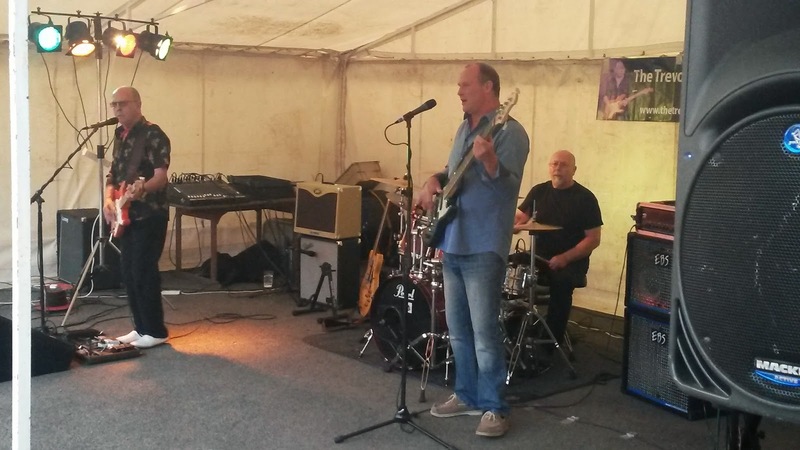 Pete later told me that he also plays a version of ELO's "Don't Bring Me Down" from time to time and that it may well feature during his forthcoming date at The Robin 2 on Wednesday 27th August. And what of The Trevor Burton Band? This was the first opportunity for Yours Truly KJS to have a look at [and a listen to] this new look four piece TBB unit with 'Movette' and new 'Burtonette' Abby Brant joining Trevor, bassist Pez Connor and drummer Bill Jefferson for an entertaining and ultimately astounding performance at The Swan in front of several hundred onlookers. Abby melded with the TBB with consummate ease. And make no mistake about it, this was a stunning debut for the expanded band with the added keyboards and vocals adding a new dimension and energy to their sound in a way that totally captured the attention - and applause - of the audience. The fact that this was a free concert as part of the 2014 Brewood Music Festival made it even more amazing. With storming renditions of Traffic's "Dear Mr. Fantasy", John Hiatt's "Master Of Disaster", Trev's very own "Down Down Down", the obligatory "Hey Joe" masterclass, a thumping version of Bruce Springsteen's "No Surrender" [amongst not a few others] and a superb encore performance of The Beatles' "I Saw Her Standing There" to round off the night, the band fully deserved the prolonged appreciation that followed. 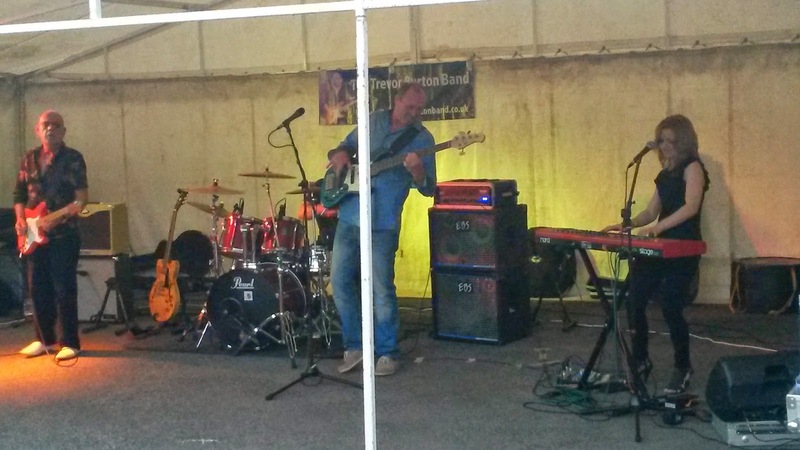 And with Tony Kelsey due to regularly join the ranks next year too, who knows where The Trevor Burton Band will go? The answer is, of course, from strength to strength. Don't miss out ... Go see 'em folks! Set highlights: "Down Down Down"; "Master Of Disaster"; "Little Rachel"; "Dear Mr. Fantasy"; "Heartbreak Hotel"; "No Surrender"; "Hey Joe"; "I Saw Her Standing There"
ELO Beatles Forever [ELOBF] recommends The Trevor Burton Band and Pete Kent to those enlightened folks who enjoy the music of ELO, Jeff Lynne, Roy Wood, The Move, The Idle Race, 'Brum Beat', The Beatles and related artistes.